The pearl of Israel, Tel Aviv's city guide includes the city attractions, shopping and dining places, excursions and travel tips and more. Tel Aviv is a relatively young city when you compare her to her neighbour Jerusalem. Where Jerusalem–just up the hills from Tel Aviv–is steeped in history and traditions, Tel Aviv is like her younger sister full of fun and vivacity. Tel Aviv is well known across the world as a party destination – it is a place where the fun never stops. When visiting Tel Aviv, you will be amazed by the casual and relaxed atmosphere of her residents. Do not be surprised to find crowded beaches and cafes even if it is late at night. The city along the Mediterranean shores has stunning beachside hotels, fashionable boulevards and exotic living quarters that you can explore at leisure over a day or two. This city has some excellent restaurants, cutting-edge art scene, vibrant nightlife and some great theatre to make your holiday a fun filled albeit a relaxed one. The perfect time to visit this great getaway by the sea is in spring when you can avoid the heat of the summers and the chill of the winter months and enjoy the beaches. After you have had your fill of the beaches, head out to explore the numerous museums and shops at Neve Tzedek, then stroll through the White City of Tel Aviv and admire the Bauhaus architecture. When the sun dips below the horizon, leave the beaches for the city centre to catch a dance show at Suzanne Dellal Centre or visit any of the happening clubs and bars for a night of your life. Tel Aviv is waiting you to offer her unique charm that is not similar to any of you know! Tel Aviv is a very young city, born only in the early 1900s, yet is a major cultural and economic hub of Israel. It is an urban sprawl located on the Mediterranean coast about 40 miles away from Jerusalem. Tel Aviv is near the very old port of Jaffa, which was incorporated into the Tel Aviv metropolis and is a major tourist attraction. If you are travelling to Tel Aviv by air, then Ben Gurion International Airport would be your port of entry. Be prepared for stringent security measures at this airport, because of where it is located. The best way to get to Tel Aviv from Ben Gurion is by train and the station is located in Terminal Three. The service is cheap and frequent but is suspended during Jewish holidays and from sundown Friday to sundown Saturday. You can also travel to the city centre by a taxi, which is the most expensive and the most pleasant way to reach the city centre. In Tel Aviv the first thing to do is spend a day of leisure at the beaches. There are family beaches for you to soak up the sun and frolic in the surf for the entire day. After savouring all that the beaches have to offer, head out to explore the delights of this uber cool city. Walk along the White City and admire the Bauhaus architecture with its distinctly European flavour, stop at the Jewish People Museum to understand the Jewish people and their history and the Eretz Israel Museum for a crash course in history. There are a number of art galleries and art museums too, for you to browse at leisure like the Eden and the Bruno Gallery at Ben Yehuda Street and the Gutman Art Museum and the Tel Aviv Museum of Art. After satiating your hunger pangs at any of the picture perfect cafes take a stroll down the pretty Rothschild Boulevard and admire the buildings around you. You can also visit the Old Jaffa Port which is one of the ancient ports of the world with its fair share of myths and legends. There is also a famous flea market nearby which is fun to explore. After a travel filled day, as the sun dips and disappears blow the sea, it is time to head to beaches like the Gordon Beach to relax and listen to Brazilian drums as stars come out one by one in the dark sky and the smell of barbeque mingles with the sea breeze to create a unique fragrance that is distinctly Tel Aviv. Let the fashionista in you loose at Tel Aviv because Tel Aviv has it all – shopping streets, trendy boutiques, upmarket malls and flea markets. Dizengoff Street with its chic shops selling clothing items to accessories are very popular amongst tourists, as is the Kikar Ha Medina Square with its shops of both international and local designer wear labels. The hustle and bustle of the markets with their exotic flavours and colours are also a sure draw for tourists. Some of the popular markets are the Carmel Market, the Flea Markets, and the Nahalat Binyamin Pedestrian Mall. There are many shopping malls too that carry both local and international goods and brands, and some of the more popular ones are Azriely, Ramat Aviv mall and the Ayalon mall. There are a number of tours and day trips that you can make from Tel Aviv, and the most favourite is of course the trip to explore the ancient city of Jerusalem with its many wondrous sites deeply rooted in history. Then you can arrange for tours, mostly day trips, to Bethlehem, Dead Sea, the Old City of Acre and the ruins of Masada from Tel Aviv. Time permitting you can even plan day trip to the historic city of Petra in the neighbouring country of Jordan. 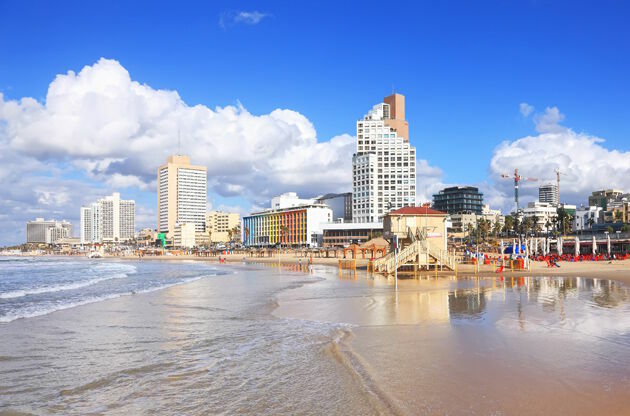 Tel Aviv, with its charming location and one of a kind aura stands as a great city to discover for most of the event attendees. In addition, because of the recent developments in the tourism scene; for example with the increasing number of good quality hotels and high tech equipped venues, Tel Aviv has become a hub for a large number of international congresses, conferences, symposiums, fairs and trade shows.